Marble vs. Wood Thresholds: Which One is Better? Throughout the nation, builders reach for wood thresholds when completing a doorway, but there’s a better choice available. Rather than going with this common material that can be found in any tract house in the suburbs, make your next project stand out by switching out the thresholds with luxurious marble. You’ll love the look, it’s easier to care for, and it just might boost your curb appeal. Whether you’re working on a major project or just redoing a section of your home, here’s what you should know about marble compared to wood. The beauty of marble is that it’s relatively maintenance-free once you install it. Wood needs regular applications of protective coatings to keep it safe from moisture and sun damage. Otherwise, the wood dries out over time, splinters and then has to be replaced. This typically isn’t a concern with marble. Properly installed over a stable and secure base, it can withstand the foot traffic without cracking. It’s not prone to sun damage, and it won’t dry out with the elements. While a wood threshold may well have to be replaced after several years, a travertine or black granite one may last as long as the house. Wood must be stained or painted in order to protect the surface, but the beautiful color wears down over time along with the protective finish. This is an ongoing challenge with wood thresholds, but marble doesn’t have this problem. Marble is forged by nature and the colors are consistent all the way through the stone, so the tones will remain true even after years of use. While other materials may fade and start to show damage, marble may be just as beautiful and colorful in ten years as it is on the day of installation. Choose thresholds in shades of tan with travertine or Crema Sahara Marfil, a sleek black granite, pure white thazoz, or Nuevo White Carrara marble to give your project the perfect finishing touch. Wood thresholds are expected, and most people don’t give them a second look. Marble, however, stands out and calls attention to itself. It’s one of those unexpected details that can make any home more attractive and sophisticated. The smooth stone surface may reflect light to help brighten the nearby areas, and the polished look is appropriate for modern and traditional decorating schemes alike. It’s an easy way to make an otherwise dull area look more appealing, and it can give any property a more sophisticated feel. Open floor plans are growing in popularity, but there may still be transition points where the tile of a kitchen meets the hardwood of the other living areas. There are numerous transitions to consider, but marble is an excellent choice because it can go with practically any other material. You can blend the marble with the existing surfaces to create a better flow, or you can go with a contrasting color that will help define the different space in the room. Marble thresholds can be set flush with most floors for a seamless transition that won’t create any tripping hazards. In addition to ordering flat transition strips that are commonly used for doorways, you can also go with beveled edges along one or both sides. This makes it easier for people with limited mobility or wheelchairs to navigate the threshold. While wood can be cut to create a gentle curve, marble will withstand the strain of wheelchairs or other mobility devices better. Any time you’re dealing with a situation where the doorways should be handicapped accessible, you may find that marble is a more durable choice that’s also easier to navigate. Wood thresholds may be cheap, but that doesn’t mean that marble is out of your budget. In fact, many builders feel that marble is more cost-effective because it has the power to boost the appeal of a home and help them fetch a better selling price. This makes it more cost-effective for people who are focused on quality and want to make a great impression. If you know which supplier to go through, then you can also save on the purchase price. Buying from a wholesaler is perhaps the best way to get the marble thresholds that you’ve been looking for without spending a small fortune. 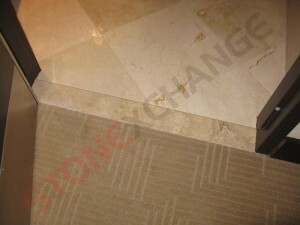 When you work with Stonexchange, you’ll receive top quality stones and great customer service at low wholesale prices. When you buy wood thresholds, you’ll usually wind up cutting them to fit at the point of installation. Marble thresholds are manufactured in the most common doorway sizes, but you can also custom order sizes that will suit your needs perfectly. This is an excellent way to keep your installation and labor costs down on the job site. Here at Stonexchange, the same individuals responsible for crafting our regular inventory will handle your custom order, so you can count on them for quality work and meticulous service. We ask that you allow a few weeks for custom orders to be filled, but you can count on our team for painstaking work and pristine finishes. When planning your next big project, take a close look at the little details like thresholds. Marble will last longer, hold its color, and give your home a beautiful finished look that you’ll never grow tired of. We take steps to keep our costs down throughout the production process and then pass those savings on to you. The result is wholesale pricing for high-quality stones, so you may be surprised at just how affordable it is to add marble to your home. We’re committed to customer satisfaction, and our highly trained staff will answer all of your questions and help you choose the right thresholds for your needs. Give us a call today to discuss your upcoming project and place your order, or browse through our site to take a look at our inventory, in-stock sizing options, and custom ordering requirements.